Join the MIT Club of the Delaware Valley for a tour of the U. S. Mint in Philadelphia. This is a 45 minute self-guided tour. View the actual coining operations from 40 feet above the factory floor and see the first coining press, used to strike our nation's first coins in 1792. Watch as they make one million coins in 30 minutes – a task that took the early mint three years! Additional tour highlights and other information can be found on the U.S. Mint Web site. Our tour is on Saturday, July 10. Assemble at 11:30AM in entrance of the U.S. Mint on 5th Street north of Arch Street. Tour of the Mint is free. Adults will be required to show government-issued photo ID. Photography, smoking, eating and drinking are prohibited. The tour will be discontinued if the Terrorism Threat level reaches ORANGE or above. After the tour join us for an optional, pay-your-own lunch at the Fork Café (a.k.a. Fork:etc. ), 308 Market Street. Other attractions in the immediate area that you could also tour on your own include: Liberty Bell (Saturday Hours 9AM to 5PM), Independence Hall (Saturday Hours 9AM to 5PM), Federal Reserve “Money on Motion” exhibit (Saturday Hours 10AM to 4PM) and National Constitution Center (Saturday Hours 9:30AM to 6PM). Assemble at entrance of the Mint on 5th Street north of Arch Street. Cost: FREE Mint Tour, but registration is requested to help us plan. Join your MIT friends at one of the area’s premier summer events, The Brandywiners’ annual production at Longwood Gardens' outdoor amphitheater. This year they are performing the classic romantic comedy Guys and Dolls. The Club has its own permanent block of seats (we chose the best in the house). They will sell out quickly so send your reservation soon! If our theater block is sold out, unless you request otherwise in the registration, we will do our best to get the best seats still available. Your tickets will be mailed in late July. We also have optional dinner reservations at the Longwood Gardens Terrace Restaurant for their Terrace Barbeque Buffet (menu below) before the play. 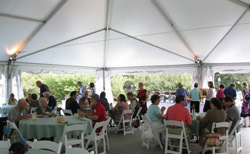 The buffet will be served in their huge outdoor tent -- a beautiful setting that was very well received last year. This is a fine opportunity to enjoy an informal summer meal, relax together after seeing the gardens and meet other MIT people before the play. The additional cost for the dinner is $31 per person. So, all together we are providing a full day to peruse Longwood Gardens, a relaxing barbeque dinner together, and of course the Brandywiners performance! Your ticket is good for Longwood Gardens admission the entire day Saturday regardless of weather.